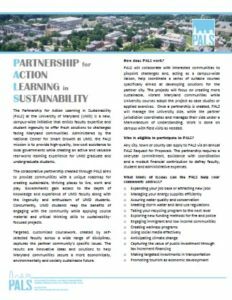 PALS will select a local government with which to work for an academic year (two semesters) and ask that local government to identify specific sustainability challenges with which they would like assistance from the University of Maryland. These challenges could include things like urban revitalization, storm water or solid waste management, economic development, social service management, communications, social media, financial management, public health, environmental protection, culture and arts, and more. PALS staff will then look for faculty who teach existing courses from across campus who are willing to focus their course or course project/case studies on the challenges identified by the chosen local government. 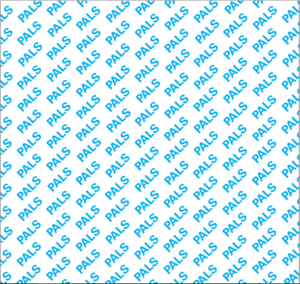 Who can participate in PALS? 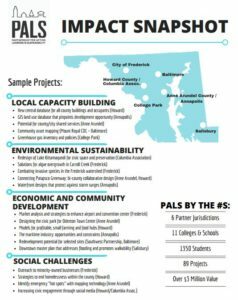 Any city, town, county or community government office can apply for to partner with the PALS. Agreeing on the partnership requires a one-year commitment of coordination and a modest financial contribution to defray faculty and student expenses. What sorts of issues can PALS help your community address?